Feeling Confident In Your New Home! A new home is a major purchase for most everyone. And naturally, there are some concerns that come with making that purchase. What kind of product am I getting? What if something goes wrong? Who’s going to be responsible for possible issues? Through years of dedicated customer service Gustafson Properties, LLC has developed a reputation of quality and dependability! Our homes are constructed of 100% Hardie material on the outside, reducing future maintenance and repairs. Our systems and products are purchased from industry leading manufacturers, such as American Standard and Delta. Recently, we have even started introducing Smart Home Technology as a base package into our new homes. Aside from these things, we have developed a reliable group of sub-contractors that provide excellent workmanship and stand behind it! In something as complex as a home, however, there is always the potential for an issue to arise. For this reason, every one of our homes comes with a Bonded Builders Home Warranty. This warranty covers workmanship for 1 year, systems for 2 years, and structural items for 10 years. It is a worthwhile investment that we make in every home we sell, providing us with the reassurance that you will be more than happy with the home you purchased from us, and providing you the reassurance that there are no hidden surprises. As always, we love hearing back from our customers! And we would love the opportunity to work with you! If you’re looking to build or buy a new home, don’t hesitate to call us, or visit our website at www.gustafsonproperties.com. At the bottom of our homepage, there is a small contact us form that can be filled out and submitted. Once submitted, you will be enrolled in a 9-week email campaign where you will receive one email a week walking you through some basic “getting started” topics, such as lender and appraisal information. This is an excellent place to start if you want more information on building a custom home but aren’t quite ready to meet yet. If you have any questions or concerns, don’t hesitate to contact us! Installing a home theater, or media room, may be just the touch you’ve been wanting to give your home, but where do you start? Obviously, designing a quality media room isn’t as simple as just hanging a TV on the wall and dimming the lights. There are sound factors that must be accounted for, placement considerations, and of course, budgets. In his article, John addresses everything from room shapes to viewing angles. It’s an excellent read for anyone considering incorporating a media room into their home. On the other hand, if you’re currently considering building or buying a new home with a media room, don’t hesitate to contact us about some excellent floor plans for doing just that. One such plan is shown below and is currently being constructed in the beautiful Bonne Terre subdivision in Horn Lake, MS. Feel free to contact us for any additional information. We look forward to hearing from you! We’re taking a break from our typical home blogs this week. The circumstances facing our country are heart-wrenching and tragic. The divisiveness, anger, and hate that we have fallen victim to has started to tear to pieces the very foundation of love and hope that we as a nation have come to be known for. I have felt compelled to write or comment myself on the situation we are in, but can’t quite find the words to describe how I feel. For that matter, I’m not a 100% sure how I feel about the circumstances at all. That being said, I wanted to share a passage from the Bible that has always stuck with me. This whole conflict is centered around our differences- different races, different social and economic statuses, different beliefs; but the solution lies within each of us. Don’t misinterpret the point of the above passage. The lesson doesn’t lie in the finances, races, or beliefs of the rich and poor man. The lesson is that David was quick to lash out against others without first examining his own faults. I believe in God. I believe that God has the same love for each and every one of us, regardless of our differences. I believe he truly cares for us as His children in the same way we do for our own children. Like everyone else, I forget this at times (and so I’m not excluding myself), but I know it to be true. Having said that, think about the love you have for your children. Think about the hope and dreams you have for their wellbeing. Then, consider the way you view and speak to others because, in the big scheme of things, we are all equally important to a loving Creator. “4 Love is patient, love is kind. It does not envy, it does not boast, it is not proud. 5 It does not dishonor others, it is not self-seeking, it is not easily angered, it keeps no record of wrongs. 6 Love does not delight in evil but rejoices with the truth. 7 It always protects, always trusts, always hopes, always perseveres. We build homes for a living, but ultimately this country is home to all of us. We should strive to protect it from the destruction of hate! If you’re taking the opportunity this 4th of July weekend to look at a potential new home, don’t pass up this beautiful home located in Emerald Estates in Eudora, MS. It’s filled with extras and conveniently located in a quiet cove in a wonderful subdivision. Not able to break away this weekend? Visit the link below to view the virtual tour! If you’re interested in building or buying a new home, don’t hesitate to contact us! We would love the opportunity to work with you! Have a great holiday weekend!!! Get Ready To Build Your New Home!!! We care about our work, and we want to make sure our customers get the home they deserve! That means thoroughly discussing every phase of construction and every selection our customers want. It means meeting onsite several times throughout construction and following up several times afterwards! For many people, just knowing where to get started can be difficult. Don’t worry! By simply providing us your name and email in the form located at the bottom of our homepage (www.gustafsonproperties.com), you will receive a newsletter and email providing you all the information you need to take those first steps towards building a new home! It’s all free, and it’s all just a click away!!! Don’t waste any more time! Visit www.gustafsonproperties.com and contact us today! One of the most exciting parts of building a new home is selections! Among the wide array of selections customers get to sort through, is that of countertops. Countertops are an important part of any kitchen. In addition to the look they bring to a new home, there are other factors to take into account, primarily durability and cost. Below is a link to excellent article outlining the pros, cons, and costs of some of the various types of countertops tops on the market today! Enjoy the good read and don’t forget to contact Gustafson Properties, LLC when you’re ready to build your new home!!! 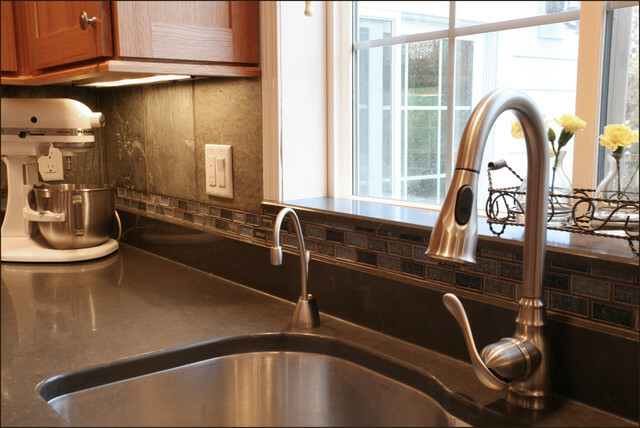 Insulate your outside faucets. If you have a water hose hooked to your outside faucet, unscrew it until warmer months roll back around. Otherwise, standing water and ice-cold air trapped inside the hose have a direct path into your indoor plumbing. Styrofoam faucet covers can be purchased at just about any local hardware store for a little of nothing and will offer excellent protection against the outside elements. Insulate your water heater lines. Water heaters are typically kept in the coldest parts of the home (attics, garages, etc.). Be sure to inspect the water lines running to the water heater. Make sure they are adequately insulated with foam pipe covers. Change your air filter regularly. This should be a year round chore anyways. Most air filters should be changed every 30-60 days. Dust can accumulate in your system throughout the year. When you turn the heat on for the first time, all of that dust can be stirred up. This can lead to dirty filters that restrict airflow, and therefore, work against you in maintaining a comfortable temperature. Reverse your fans. If you have reversible ceiling fans, flip the switch. Warm air rises. Reversing your ceiling fans will create a circulation in the room that will keep all of the heat from settling up high. Seal openings around your doors. This can mean replacing worn weather-stripping with new, installing larger door sweeps to the base of your door, or applying foam insulators along your jambs. Preventing cold drafts at the entry points of your home is key to keeping your interior temperature where it needs to be. Follow these steps and keep your home safe from the outside elements this winter. Don’t forget to check us out online at www.gustafsonproperties.com and contact us if your ready to build your new home! We look forward to hearing from you!